Our line of bulk banner displays is designed for company's looking for volume purchasing. All of these banners are imported from China in lots of six and are sold the same way to bring maximum savings to the end user. All graphic prints are done in the US and can be volume discounted if the same graphic is printed on all the banners. The DFA and Econo-roll banners are ideal or limited uses while the Orient line is designed for years of use. 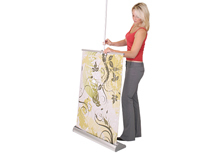 Banner stands are great for exhibitors on a budget because of their low cost and high impact. 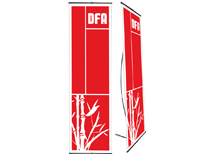 The DFA line of banner displays are designed with economy in mind for exhibitors looking for low cost display options. Econo-roll banner displays are the lowest priced retractable banner stand available. These are ideal of exhibitors who need multiple banners for one time use. Orient banner displays are a great value and NWCI packeges them in bulk to bring lower costs to the end user! There are multiple sided to choose from! 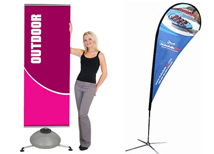 Most companies looking for outdoor banner stands usually buy in bulk. All of our bulk flags are in bundles of six with volume discounting applied! We have bundled some of banner displays together for customers looking for quantity. All of our bulk banner displays are sold in packs of six and priced accordingly. This eliminates the need for quoting so you can simply order online and get your banners quickly. 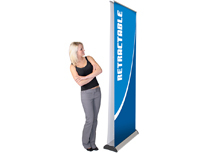 Retractable banner stands are a great value because they are economical yet very effective. Trade show displays are a great marketing tools and banner stands are a very affordable option for any convention. We carry bulk banner displays that range in quality from economy to premium in order to give our customers the largest selection of products. Many shows are a one time event that requires a unique graphic display that will not be used again, while other shows will require use of the same banner display over and over. We offer banners at all price points so you can choose the best display for your needs.